It’s the week of Imbolc, the Goddess Brigid’s Day, and the modern silly version, Groundhog Day. All are the half-way marker between Winter Solstice and the Vernal Equinox. As energy begins stirring ay beneath the surface, it is a great time to declutter, let go of roles that no longer serve you, recommit to what’s important to you, and make room for your own creativity and goals. So you could tackle your kitchen drawers. Or you could clean out the worst, most toxic mess that erodes your life. I’m talking about shame. Wouldn’t it be amazing to have unworthiness and feeling undeserving not running your sense-of-self or the way you move about in the world? This is a heavy topic, and not usually seen in blogs, but it is essential for true transformation. Shame is the single-most powerful blocker of life, liberty, and the pursuit of happiness. It is the feeling-state hiding behind acts of violence, attacking oneself, feeling undeserving, undervaluing oneself, depression, anxiety, blaming others, targeting others, picking fights, suicide, and limited lives of all sorts. There’s another type of guilt that we feel when we go against learned expectations that were not for the benefit of our growth, but were to manipulate us into meeting self-serving demands of others. This type is not healthy and stunts our sense that we have a right to our own life. Shame is not guilt or remorse. Shame is self-blame. 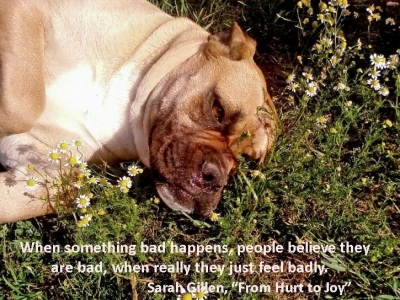 Shame bad dog 3very often develops first when children feel terrible due to painful events. 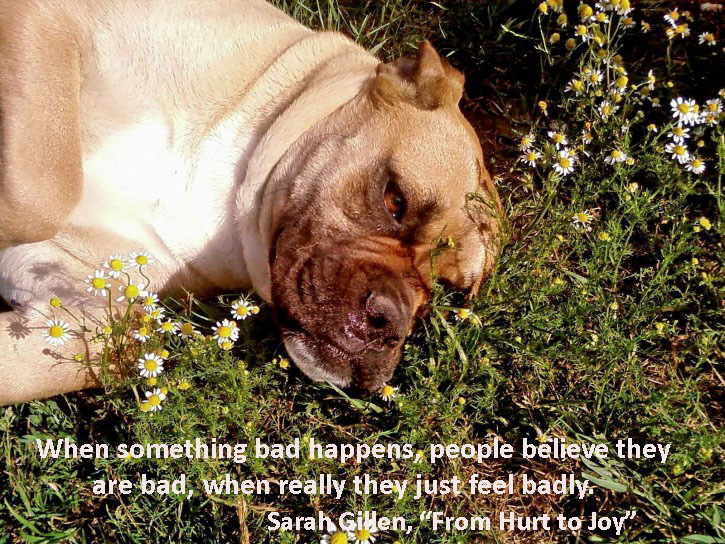 Feeling badly turns into believing that it’s their fault, so they are bad. So many people who work with me have a hidden belief that, if they feel hurt when someone says something hurtful, or angry when their rights are infringed upon, or sad when they lose someone, that feeling any badly is a sign that there is something wrong with them. Having badness as the major go-to place leads to trying anything that will get away from the intolerable feeling that they’re bad: blaming others, feeling responsible for anything that happens, being afraid of intimacy, irritability, substance abuse, depression, eating too much or too little, recklessness – anything. It is imperative to see the behaviors and thought patterns that hide a feeling of unworthiness, the belief that we are inherently bad and don’t deserve to do well or to be happy. The link between shame and our most self-destructive patterns is crucial to uncover, because we are hiding from the feeling of badness at any cost, at huge cost to our wellbeing, our health, and our futures. When we can see that shame is the real issue, we can focus on the cause, and then the patterns will be much easier to dismantle. Once we can get past the behavior patterns to the crux, the task is to Be With the shame in such a way that it can dissolve. And dissolve it will, because it is a false construct designed to defend us from our true feelings about events. When you have identified the shame, let it become apparent. Don’t fight it. Be curious about it. Locate it and notice what it feels like. Where in your body do you feel it? Locate it exactly. Don’t say “Everywhere!” That means you’re still pushing away from it and giving it way too much power. What are the sensations in your body? Is it like cold, clumpy oatmeal lumped in your stomach? Is it hot and phlegmy in your chest? Then take several deep breaths to free up your chest and torso. Bring your attention to being in your body. Notice your feet. Feel your legs. Sense the energy of your breath as light, or warmth, or bathwater. Breathe into your body around the shame place. That place is part of your energy body. You don’t want it separated from the rest of you. Gradually have your energy seep in and just be in the place in which you felt the sensations associated with shame. See what happens start to soften. Gently slide your awareness into that part of your own body, as if you too are sliding into a warm bath (if you like baths. If you don’t, try a vat of warm chocolate sauce!). Keep moving your energy into it until it is open and relaxed and no longer separated from the area around it. Very often the shame will simply disappear. If it does for you, focus on feeling your entire body. 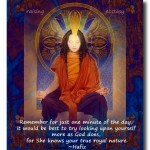 Feel the sense of peace, the sense of you in your own space, rather than damning and toxic thoughts. Feel the spaciousness. Give yourself some time to feel what it’s like to just be your good self. Let your nervous system practice connecting to this state. Then enjoy the rest of winter and the energy building to spring! If you have questions, or this wasn’t easy to do on your own, call me: 802.229.4815, or email me at Sarah@sarahgillen.com. I’d be happy to help you free your life and be more able to express the wonderful person that you are.